Ripon shire (1863-1995) was, at its centre, about 45 km west of Ballarat. Its eastern boundary was at Lake Burrumbeet and its western boundary was at the Pyrenees Ranges. The northern part of the shire was crossed by the Western Highway through Beaufort, the shire’s administrative centre, and its southern boundary was near the Glenelg Highway. Pastoral settlement in the shire occurred during the late 1830s, comprising several large estates which persisted into the 1900s. The last large estate, Carnghum, came under soldier settlement in the 1950s. Ripon is the name of the local county, from the Earl of Ripon, the British Secretary of State for the Colonies (1830-33), who in 1831 introduced the so-called Ripon regulations for the sale of Crown lands by auction instead of their conveyance by grants. In 1861 the Carngham road district was proclaimed and on 18 December 1863, it was succeeded by the Ripon Shire. 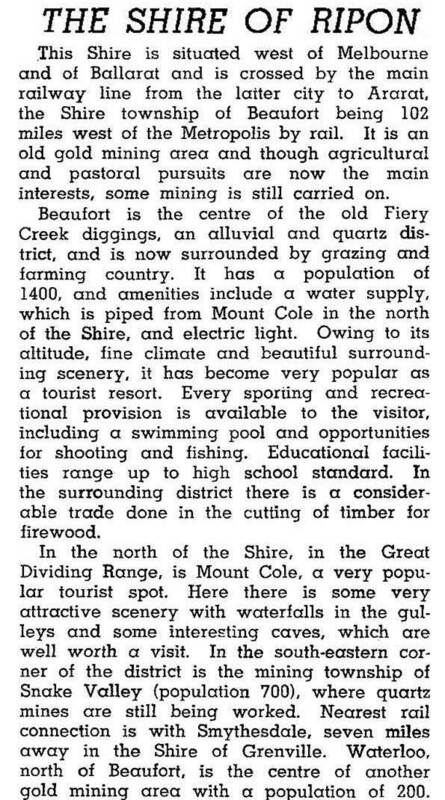 Its main industry, apart from sheep grazing was gold mining, based at Beaufort (Fiery Creek diggings), Raglan and Waterloo north of Beaufort, and Carngham and Snake Valley south of Beaufort. There was also timber cutting in the ranges north and west of Beaufort. In addition to the places previously mentioned, the names of the Langhi Kal Kal and Trawalla pastoral runs have continued with the former homestead being a youth prison facility and the latter being a small village. The James Scullin Memorial Park at Trawalla commemorates Scullin’s birth there in 1876. (Scullin was Australian Prime Minister, 1929-32). Most of Ripon shire was united with Lexton shire and most of Avoca shire on 20 January 1995, to form Pyrenees shire.